Let’s get rolling! The adventurous and fun-loving Chuck and his best friends — Digger, Handy, Rowdy, Biggs, Boomer and Flip — are at it again with more free-wheelin’ escapades! On June 3rd, 2014 Shout! 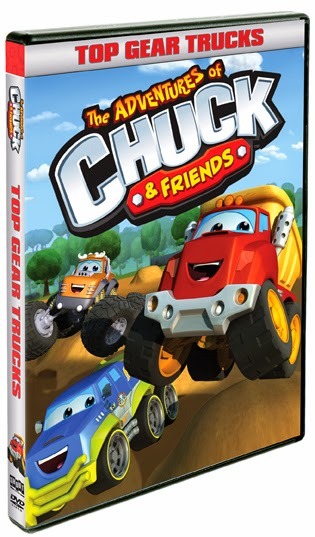 Factory Kids in collaboration with Hasbro Studios will released The Adventures of Chuck & Friends: Top Gear Trucks . The DVD features 10 exciting episodes as well as a bonus all-new sing-along, and has a suggested retail price of $12.99. My son has been a huge fan of the Chuck & Friends Series for years now and he still loves the friendly television show. He watches it whenever he sees it on TV and he loves watching the DVD's he has because he likes to play out some of the scenes with his Chuck and Friends toys he has. Top Gear Trucks is a great addition to any little kid you know who loves trucks and adventure. It comes with ten episodes with a bonus feature of a new sing a long song that is very catchy and will definitely be a hit for your little person. I love that in each episode of the Chuck and Friends series someone is learning a lesson that can relate in some way to my son. Top Gear Trucks would be a great addition to any Chuck & Friends fan! Disclosure: All opinions are my own. I received The Adventure of Chuck & Friends: Top Gear Trucks on DVD at no cost for the purpose of this review. No other compensation was received.